I was sitting drinking a cup of tea and reading the Guardian when I heard the sound of piped carols. It got louder and louder; then there was a knock on the door. I opened it to find Father Christmas sitting on his sleigh outside, though there were no reindeers in evidence; he was being pulled along by a man in a Landrover. It is a lovely festive tradition in Ashburton. 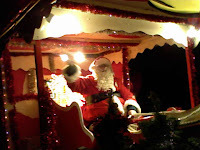 In the days up to Christmas, Santa travels around the town, calling on local children and raising money for charity. 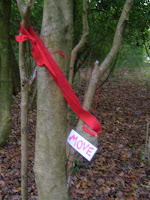 Up on the moor, by Bench Tor, we kept seeing bushes that looked, at a distance, as though they were on fire. 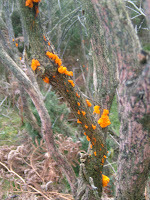 On closer examination we found them dotted with jelly-like fungi, in a range of colours from blood-orange through to clementine. Very Christmassy. 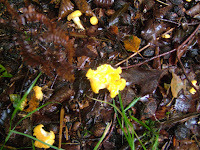 My Roger Phillips Mushrooms book tells me they are Yellow Brain Fungi. Nice. We also saw the perfectly named King Alfred's Cakes. Back in the woods we found some rather elderly hedgehog mushrooms, which nevertheless went happily into a stew for dinner. Labels: "yellow brain fungus" "king alfred's cakes" "bench tor"
My brother Matthew was down and so we headed off to Babbacombe Pier in Torquay to do some angling. It is a pretty spot, with beautiful views, and, even better, it was deserted, so we didn't have to share the pier with anyone. We caught five whiting and a dogfish, using ragworm and mackerel as bait; we put the dogfish back. 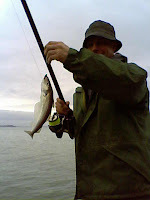 Whiting are apparently the winter equivalent of mackerel; they cruise around inshore in shoals and are quite easy to to catch. I baked them using a Madame Prunier recipe involving butter, wine, parsley and shallot. They were delicate in both taste and texture. The waters of the West Dart were dark and muscular. 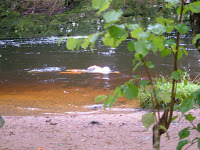 Swimming with two friends, it was a struggle pushing against the current (but a good way of fighting the cold). We swam upstream, before drifting back down again. I call this stretch of river the Amazon, because a snake swam across my path when I was there in the summer. No sign of snakes today though - only sheep. 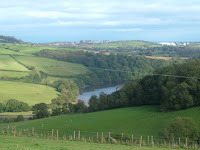 If you travel on the train between Exeter and Newton Abbot, you will see the Parson and Clark as you pass along the rugged red-cliffed coastline between Dawlish and Teignmouth. They are two sandstone stacks, just crying out to be swum to. Well, we made it to the Clerk - the stone visible in the picture - but not to the Parson which is 'round the corner'. 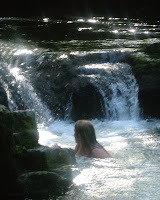 It was quite hard swimming, but very satisfying to make it to the rock, climb on it triumphantly, and then jump off. 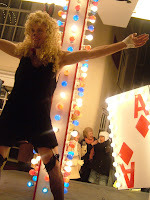 In the last Friday in November, Ashburton goes carnival crazy. 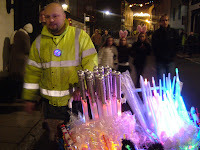 Everyone flocks into the town in the evening, and hawkers mysteriously appear, selling luminous sticks, bunny ears and the like. 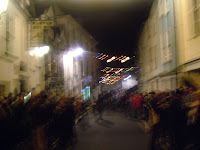 Some time after eight o'clock, you start to hear music in the distance, and then you see flashing lights bouncing off the houses at the top of the hill. It's the arrival of the carnival floats. They come down the main street, one by one, as brash as can be. You've got the traditional carnival queens, but there are also various other tableaux including, this year, the Kumars, the Jungle, and Men in Suspenders. It feels like a tradition that goes back to the beginning of time. The winter, the darkness, lights, fire...it's almost pagan. Apparently the sea in November is warmer than it is in May. And when we plunged in off Castle Cove in Dartmouth, this definitely seemed to be the case.The waters were still, and a beautiful opaque green. We swam around by the Castle, admiring its ancient walls built into the bedrock. We then headed up the estuary where we got battered by waves and winds, and so returned to the calm of the Cove, where we amused ourselves jumping and diving off the rocks. ...call for desperate measures. Is this the effect of the credit crunch? 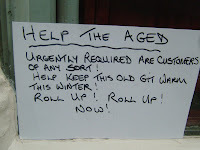 This sign has been put up in the window of the framing shop in Ashburton. 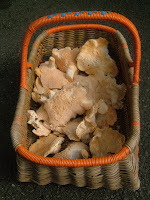 There still seem to be quite a few hedgehog mushrooms out there, but the season hasn't lived up to its early promise. 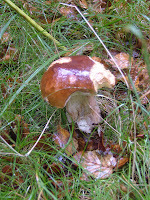 Virtually no boletes, apart from a solitary penny bun in September, and not that many chanterelles either, apart from a rash at the end of August/beginning of September. 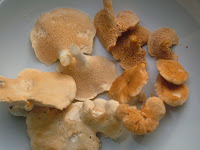 I found both types of hedgehog today: Hydnum repandum on the left of the picture, and Hydnum rufescens on the right. Today it was such therapy to get in the water. Yes, it's the beginning of November, but it saved my sanity to leave the dreary damp of Dartmoor and take to the beach and sea at Mothecombe. The colours were beautiful and muted. 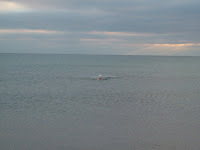 The sea was grey-green, the eye of God was visible as the sun started to set, and the water was wonderfully calm. What could be nicer, after a hard afternoon's 'shrooming, than a restorative dip in the local jacuzzi? You'd pay good money for this in a health club or spa, but it just so happens that there are several free options in the Dart. You need to prepare for a pummelling though. And it's more of a cold tub than a hot one. 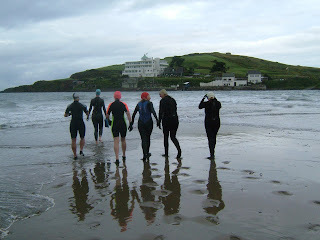 It was our second bash at swimming around Burgh island this summer. The first was abandoned due to crashing seas. Today it was perfect. Calm, clear water, glittering sunlight and WARMTH. We went round clockwise this time. As we neared the first 'corner' of the island we saw a gap in the rocks and went through - and found the most gorgeous lagoon, with amazing, turquoise underwater chasms. Swim across the Exe estuary? Why not? Apparently they used to do it all the time in the 1930s; from Topsham on the north side, to the Turf Locks on the south. Mike, the local ferryman, has revived the tradition, and 41 of us gathered for the off at high water, at 6:30pm. 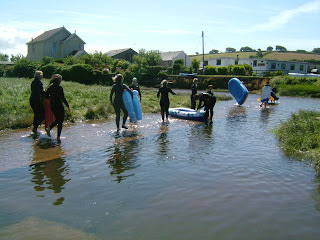 Crowds gathered on the quay and cheered as we plunged into the brackish brown - but very warm - waters of the Exe. When I finally emerged on the other side, about an hour later, it was with a red face and muddy moustache. ....not the kind that have fleas, or like eating slugs, but that delicious variety of mushroom with little spines for gills, and a kid-glove-like appearance. 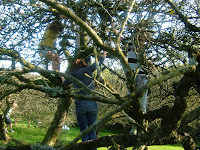 We found basket-loads in our regular haunt in the woods by the River Dart, conveniently near the car park. I always thought toads were green or brown, but no. Apparently they can be red too....as we discovered today. 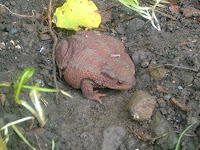 This one was sheltering under some planks in the veg patch. 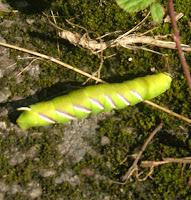 And very beautiful he (or she) was too. It was a 'return match' to Crazy Well Pool after our dark and magical discovery of it earlier in the summer (see July entry and photo below). The uphill trudge north of Burrator Reservoir paid off as the sun came out and the pool beckoned us in with its eerie aura. There is apparently a legend that at midnight on Midsummer Eve the face of the next person to die in the parish can be seen in its waters. 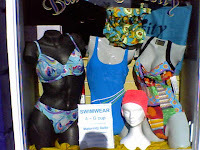 Even though it was well past Midsummer, we all avoided looking at our reflections. ...not the kind from the bakers, but the kind you find in soggy woods by the River Dart. We came upon a couple of specimens while out today. One was a sad shadow of its former self, having been badly munched, but the other - pictured - was pretty respectable, if rather wet (like us). 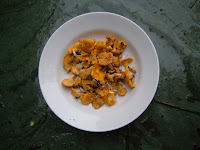 We also found chanterelles, hedgehogs, and a beefsteak fungus. It was going to be an experience worthy of the Famous Five. A friendly farmer and lashings of ginger beer, all in Devon's most southerly parish, East Prawle, with vertiginous cliffs and amazing ocean views. 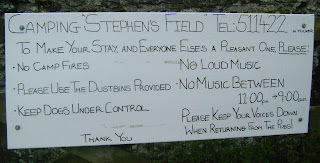 We found the friendly farmer - complete with heavenly field overlooking the sea, but after less than 24 hours we were home again. When there's a cascade in your tent, and gale force winds are lashing the flaps, the whole camping concept seems bonkers; the soggy eggy bread in the morning was the final straw. 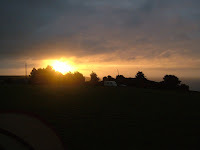 However there was one thing which made it all worthwhile - a burning sunrise which greeted me as I stumbled out of the tent to visit the portaloo. 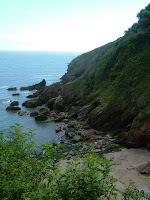 Having been to see Mamma Mia, with its glitteringly turquoise scenes of the Greek coast, I was cheered the following day when we discovered, on a walk near Dartmouth, a beach that could easily compete. 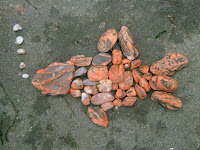 It had a cave, and lots of orange stones, some of which we made into a rather prehistoric looking fish. I was safely tucked up in bed, drifting off to sleep after a hard day's beach babing, when I suddenly remembered some unfortunate winkles festering in a carrier bag on the kitchen floor. 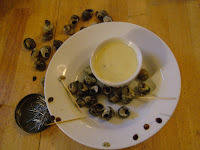 It had seemed such a good idea to gather them while rockpooling, but of course they'd been forgotten upon our return. 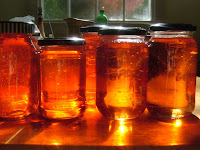 There was nothing for it but to get up, consult Hugh F-W, and start cooking. (at least they only take five minutes to boil). We ate them cold the next day. Not unpleasant, but not exactly pleasant either. Thank heavens for garlic mayonnaise. Although the Dart is currently an angry monster (they say it claims a life every year) there are still a few places where it's safe to swim. And of course when the weather's so grim, you don't have to share the river with anyone. The mermaids of Burgh Island - or at the very least the cormorants - were calling us again. Of course it would be very rude to refuse such an invitation. We'd swum round the island last summer, so knew it was possible. However today it was a bit of a daunting prospect; leaden skies, a pregnant swell and some rather exuberant waves smashing onto the island's rocky perimeter. We decided to swim across the causeway and reassess the situation once we'd got to the island. Normally you can see lots in the water as you swim - the particles of sand, the detail of the rocks, seaweed etc - but it was so rough this wasn't possible. Three of the party swam to the first 'corner' of the island and decided it wasn't safe to continue. So we turned back. We'll be back again though. 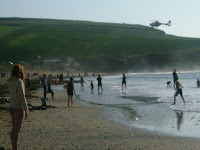 "It's like a washing machine out there", the man taking the money at the car park at Bantham warned me, adding that earlier the lifeguards had been saying it wasn't safe for children to enter the water. (disclaimers all round; mine's a double please). Fortunately by the time we made it to the surf, it was ok, although it was indeed blowing an absolute gale as the tide rushed in. The result - the best wave rides ever at this particular location. 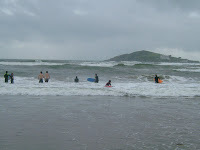 The sea was a storming lather as we were catapaulted again and again into the shore on our boards. 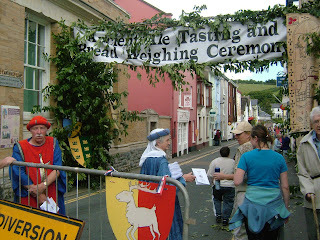 On the third Saturday of every July, Ashburton 'goes medieval' . Men in sackcloths and women in wimples take to the streets as part of the ancient ale tasting and bread weighing ceremony which goes back centuries. 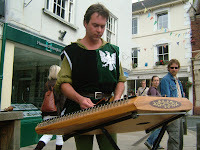 I came across a chap called Woody who was standing on a street corner playing his hammered dulcimer which he told me originated in ancient Persia but was played regularly in medieval England. 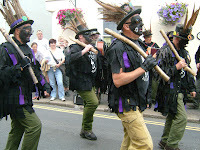 Then there were the Grimspound Morris Men who were dark and Dartmoorish. 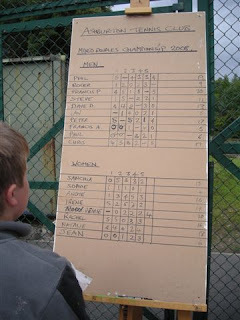 It could hardly be described as the town's sporting event of the year, but Ashburton's tennis tournament was in its way a minor triumph. The club is so laid back it's practically horizontal, so the fact that eighteen players got together on the same day, played some matches, and ended up with a rather thrilling final, was frankly remarkable. 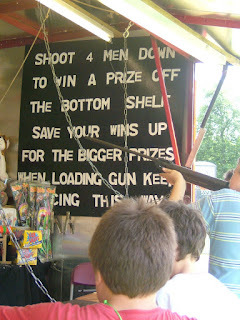 It was good-natured fun, with just the teensiest competitive edge. 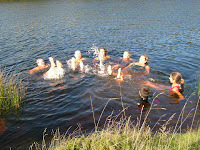 "A lido on the Moor" is how one friend described Crazy Well Pool. 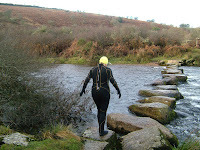 When we got there after a thirty minute uphill hike, we found a black, rippling pool surrounded by Dartmoor sky. There was a sense of strangeness, indeed otherwordliness, perhaps because of its isolation and the darkness of its waters. It also has no apparent reason for its existence; no water runs in or out. It was perfect for swimming. Backstroking gave a wonderful view of the larks overhead, and the constantly changing skies. 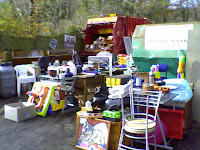 'Tis a truth universally acknowledged that on the day of the school fayre the rain shall pour and the gales shall howl. Actually it isn't - last year it was so hot that all the icing on the cakes melted. 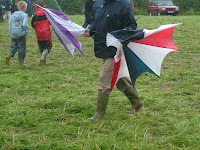 This year though, the weather WAS truly horrendous., with driving winds and curtains of rain. As the jazz band continued to play, it felt like the last hours of the Titanic. The fete kicks off Ashburton's Carnival week, reputed to be the oldest Carnival in Devon. 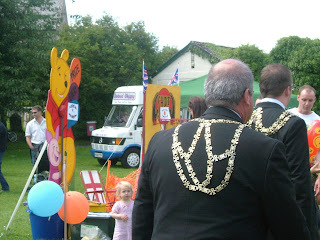 Civic bling is on show, inflatable prizes are de rigeur, (this year's 'must have' was a large bat covered in smily faces) and candy floss is readily available. Also on offer: traditional red swing boats, races for the children, and your chance to guess the weight of the lamb (which is still alive and available to stroke). The day: Sunday. 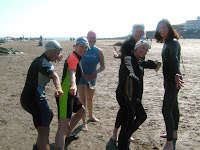 Our mission: to swim from Aveton Gifford to Bantham, down the Avon estuary. Taking part: a motley crew of women and children armed with surfboards, dinghies, one blow-up armchair and one inflatable banana. The idea was that we would drift in a leisurely fashion on the outward tide, languidly floating down the river. In reality there was a very strong wind against us, and quite low water, so there was much paddling and wading. Highlights: the swallows swooping down on us, flashing their iridescent blue plumage; the herons; and the sand on the bottom swirling through the light as we neared the beach, after our two and a half hour odyssey. Every other month, at Ashburton Town Hall, an event called 'Dance At' is held. It's described as an alcohol-free 'barefoot boogie'. You just go along and dance, though I find it works best if I go to the pub first. It can be a bit 'Totnes'. There's a lot of free expression, with occasional full-on wafting, and even people being trees (at least that's what it looks like). But don't come along hoping for romantic action - they're all far too PC to chat anyone up.